Get outdoors at River Rafting & Tubing and Kayaking & Canoeing. Step off the beaten path and head to Neer Garh Waterfall, Rishikesh and Sivananda Ashram. Next up on the itinerary: relax and rejuvenate at some of the best spas, Head underground at Vashishta Gufa, and contemplate in the serene atmosphere at Sri Venkateswara Swamy Temple. To see photos, traveler tips, and other tourist information, use the Rishikesh itinerary planner . Mumbai to Rishikesh is an approximately 4.5-hour flight. You can also drive; or take a train. Finish up your sightseeing early on the 9th (Sun) so you can go by car to Mussoorie. Kick off your visit on the 10th (Mon): delve into the lush surroundings at Jabarkhet Wildlife Reserve, head outdoors with The Real Adventure Sports - Sky Walk, then admire the sheer force of Kempty Falls, and finally stop by Hamers. To see ratings, where to stay, more things to do, and more tourist information, read our Mussoorie driving holiday tool . Traveling by car from Rishikesh to Mussoorie takes 1.5 hours. Alternatively, you can do a combination of bus and taxi. Finish your sightseeing early on the 10th (Mon) so you can travel to Badrinath. Badrinath is a holy town and a nagar panchayat in Chamoli district in the state of Uttarakhand, India. On the 11th (Tue), explore the striking landscape of Valley of Flowers National Park. Get ready for a full day of sightseeing on the next day: steep yourself in history at Bheem Pul, take in breathtaking views at Vasudhara Falls, then explore the activities along Saraswati River, then take in the spiritual surroundings of Brahma Kapal, and finally contemplate in the serene atmosphere at Tapt Kund. For traveler tips, other places to visit, more things to do, and other tourist information, go to the Badrinath road trip planner. You can drive from Mussoorie to Badrinath in 11.5 hours. Finish your sightseeing early on the 12th (Wed) so you can travel to Joshimath. Jyotirmath, also known as Joshimath is a city and a municipal board in Chamoli District in the Indian state of Uttarakhand. On the 13th (Thu), explore the wealth of natural beauty at Valley of flowers - Hemkunt Sahib. Here are some ideas for day two: explore the striking landscape at Gorson Bugyal, then head outdoors with Auli, then take in the spiritual surroundings of Vridh Badri Temple, and finally contemplate in the serene atmosphere at Joshimath. For photos, where to stay, traveler tips, and tourist information, go to the Joshimath trip itinerary planning tool . Getting from Badrinath to Joshimath by car takes about 2 hours. Finish up your sightseeing early on the 14th (Fri) so you can travel to Ukhimath. Kick off your visit on the 15th (Sat): take in the spiritual surroundings of Omkareshwar Temple, then contemplate the waterfront views at Deoria Tal Lake, and then delve into the lush surroundings at Chopta. To find reviews, other places to visit, ratings, and other tourist information, you can read our Ukhimath online trip planner . Drive from Joshimath to Ukhimath in 4.5 hours. 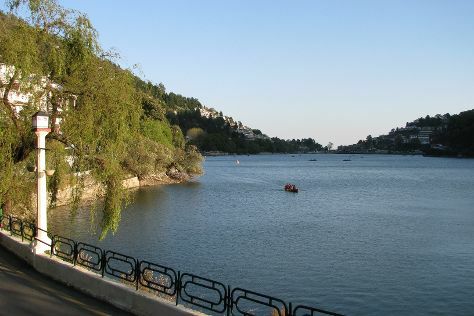 Cap off your sightseeing on the 15th (Sat) early enough to travel to Nainital. Start off your visit on the 16th (Sun): take in the spiritual surroundings of Goddess Naina Devi, look for all kinds of wild species at Pangot and Kilbury Bird Sanctuary, and then take your sightseeing to a higher altitude at Naina Peak. On the next day, take in the spiritual surroundings of Neeb Karori Kainchi Dham, don't miss a visit to Naina Devi Temple, and then contemplate the waterfront views at Nainital Lake. To find where to stay, photos, and tourist information, go to the Nainital vacation planner . Traveling by car from Ukhimath to Nainital takes 9 hours. Cap off your sightseeing on the 17th (Mon) early enough to travel back home.